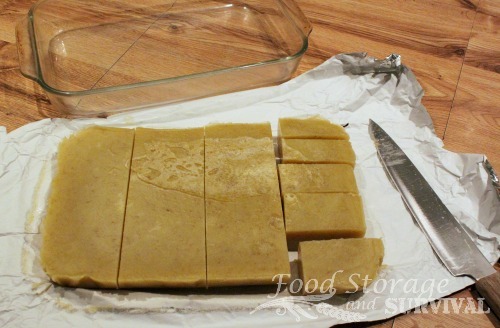 Have you been wanting to make your own soap at home but not sure how to do it? 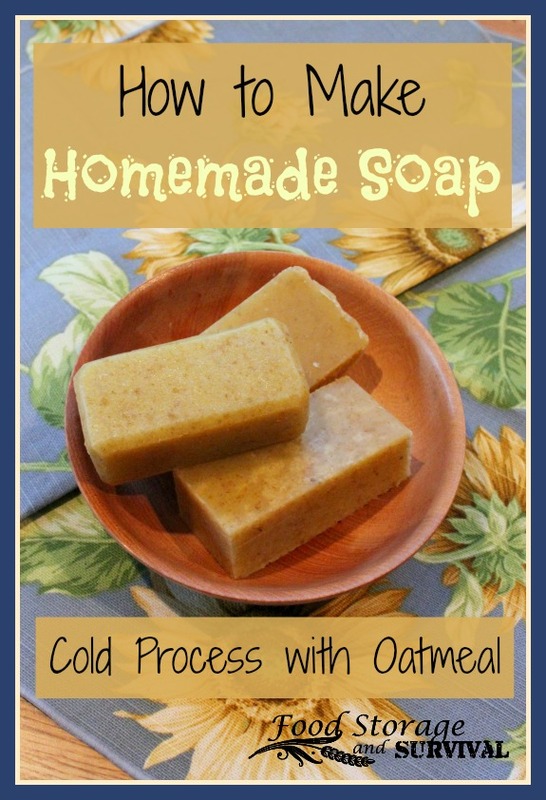 Well I’m going to walk you through soap making using the cold process. Now, the name “cold process” is a bit misleading. Things still get hot as you’ll see. But we’re not stirring everything together in a big pot over an open fire like grandma (called “hot process”). We’ll try that another day. 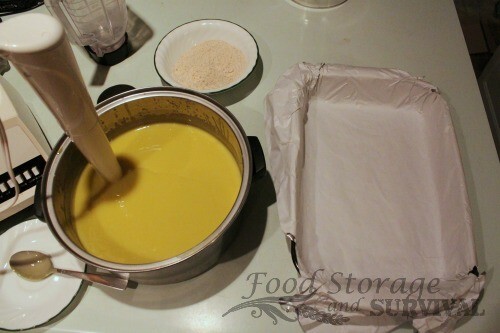 For today, we’re making cold process soap. It’s pretty easy, and the soap is so much better for your skin than commercial soaps. Plus you can make any variation you want! Optional additives of your choice like oatmeal, flower petals, essential oils, ground cinnamon, dried herbs, orange peel, fragrance oils (mine are from Wellington Fragrance). Immersion blender–not 100% necessary, but it cuts your soap mixing time down from hours to about 20 minutes. This is not a melt and pour soap. We are using lye and lye is extremely caustic. It will burn your hands and eyes on contact and corrode some metals. The protective gear at the end of the list above isn’t optional. 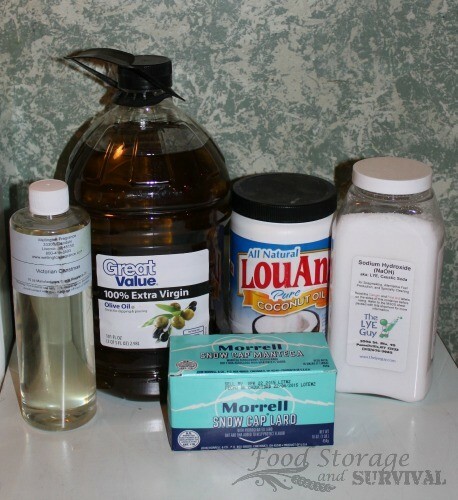 If you spill some lye, pouring vinegar on it will neutralize the chemical. All ingredients are measured by weight. Just because 1 cup of water is 8 oz, doesn’t mean 1 cup of oil or 1 cup of lye is. Use the scale for happy soap. I’ve tried estimating when my scale was broken and it just didn’t work. 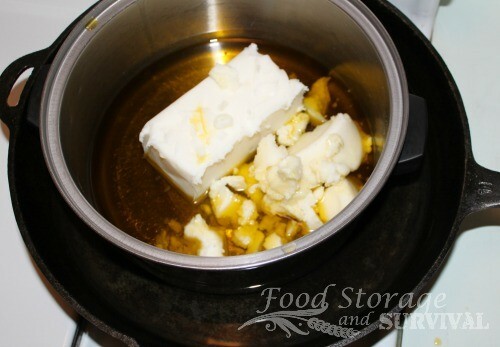 Measure the oils by weight using your scale, and put them all in a double boiler. I put them in a pot and put that pot in a larger pan of water. 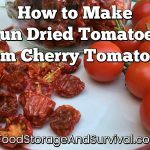 Heat them on low heat to melt and blend them together. 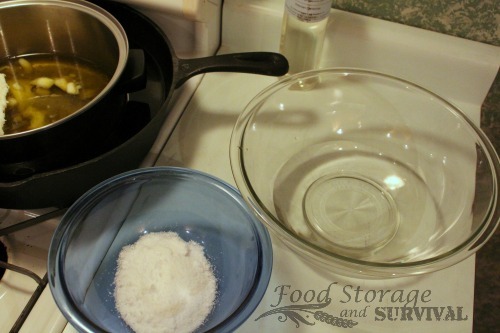 While the oils are heating, measure the lye and water in separate GLASS or plastic bowls. Not metal–remember, lye eats some metals. Stainless steel is okay if you need to, anything with aluminum is not. 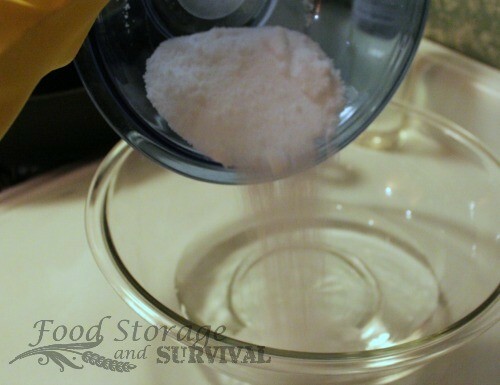 Slowly add the lye powder to the water and stir to dissolve. You may want to do this step outside. It gets quite hot and releases fumes that probably aren’t great to breathe. I just opened windows opposite each other to air the room out. 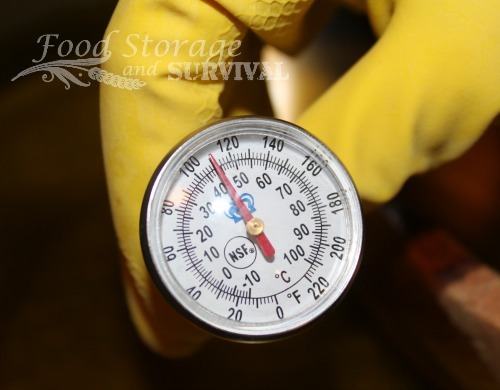 Now, check the temperatures of the lye water and the oils. You want them both within a degree or two of 110 F at the same time. 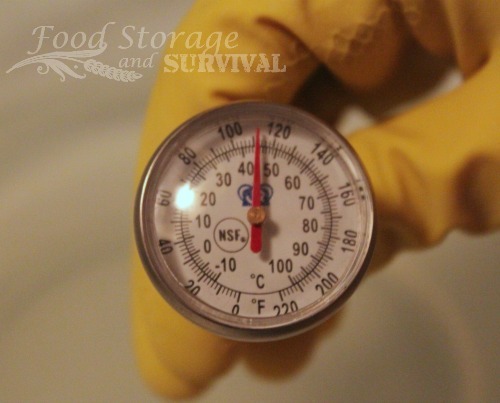 The lye water will be hotter than that to start with, so your job is to get the oils to 110 F at the same time the lye water cools down to that point. 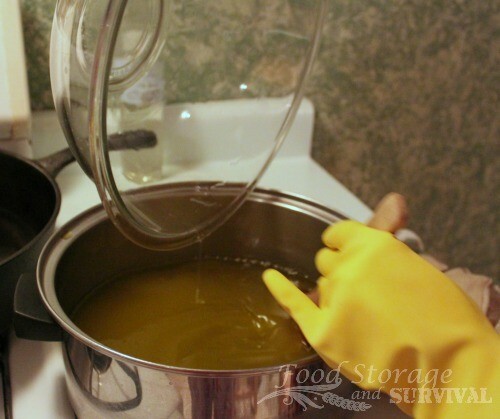 If your oils get too hot and need cooling off, remove them from the double boiler, replace the hot water in the large pot with cold water (add ice if necessary) and put the oil pot back in, stirring until it reaches the correct temperature. Be sure to get a photo of yourself in your protective gear. I probably should have gone one step further and worn long sleeves! If you forgot to line your pan, now is a good time to do it. You’ll thank me later. When the oils and the lye water are both at 110 F (within 1 degree either way is okay), it’s time to combine them. 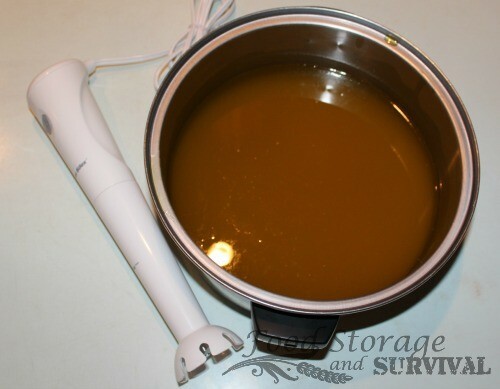 Slowly pour the lye water into the oils, and stir. 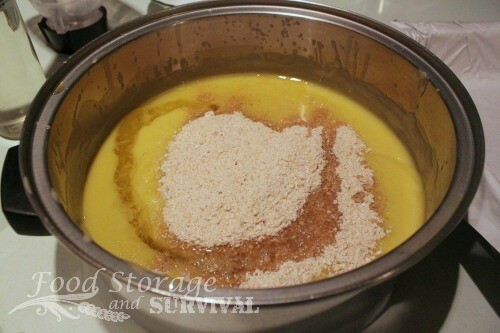 Using an immersion blender, pulse and stir for a minute or two, then blend for another 20 minutes or so until the soap reaches “trace”. Oils and immersion blender ready to get mixing! When your soap has reached trace, it’s time to add any extras you want. 1-3 oz. of essential oils or fragrance oils, up to 1 cup dry ingredients like crushed or whole flower petals and oatmeal. I blended up 3/4 cup oats in my blender and added them plus about 1/4 cup (a little on the high side) Victorian Christmas fragrance oil from Wellington Fragrance. 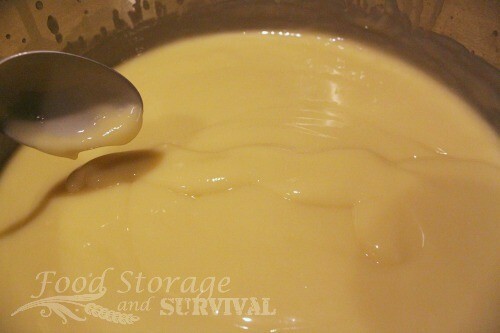 Blend the additives in, and be ready to pour. 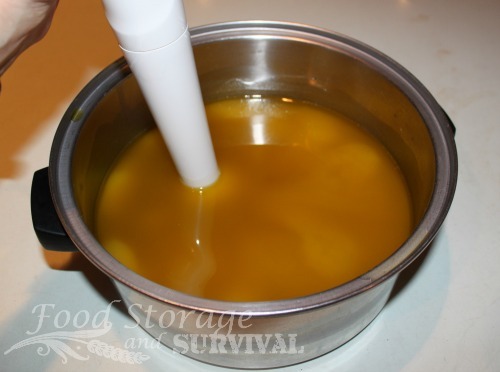 Some additives will make your soap want to set up faster, so if you notice it getting very thick, get it poured into the mold as soon as possible! Mine didn’t cause any trouble. 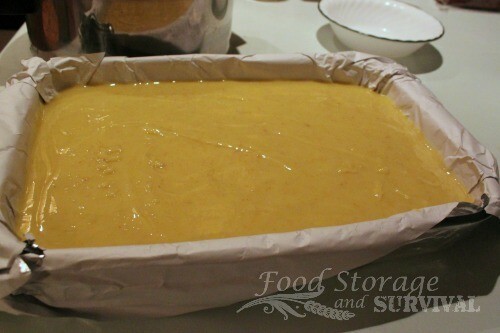 Once the soap is thoroughly blended, pour it into your mold. 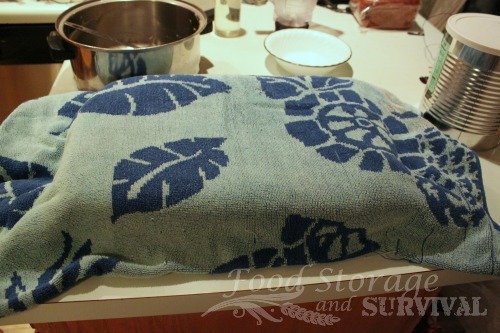 Cover it (not with foil-the lye is still somewhat caustic at this point) and wrap it up in towels or a blanket so it will cool slowly. Set it somewhere it won’t get bumped and wait 24 hours. At the end of 24 hours, your soap should be set up but soft. Now is the time to lift it out of the mold and cut it into pieces. If you want them to look a little prettier, you can trim the wrinkly spots and bevel the corners with a potato peeler. Square and ugly is fine, too, especially if you don’t plan on giving them as gifts or entering them in your county fair. Soap is soap. Now they need to cure. This usually takes between 4 and 8 weeks. Leave them open to the air–I set mine on top of a cupboard, out of reach. As a bonus, it smells really nice by that cupboard while they’re curing. Turn the bars over occasionally so all the sides get aired out. Once they’re cured, they are ready to use! 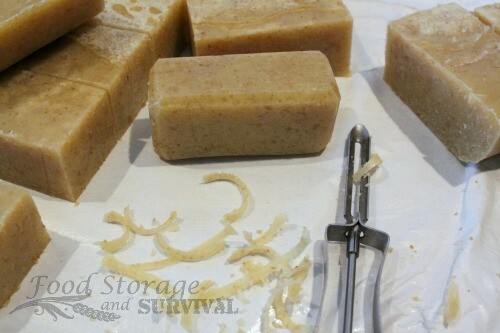 Enjoy washing with your own homemade soap! 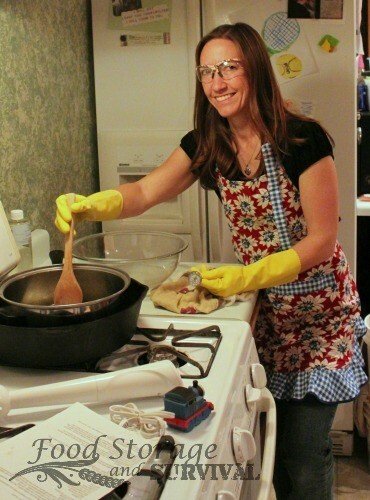 I have always wanted to make soaps, but so far have only ventured into melt and pour, LOL! This is a great tutorial – thanks. You canNOT simply exchange oils/fats for other oils and fats without running the recipe thru a soap calculator (or doing the calculations yourself) since each type of oil needs a different amount of lye to form soap without having extra lye left. 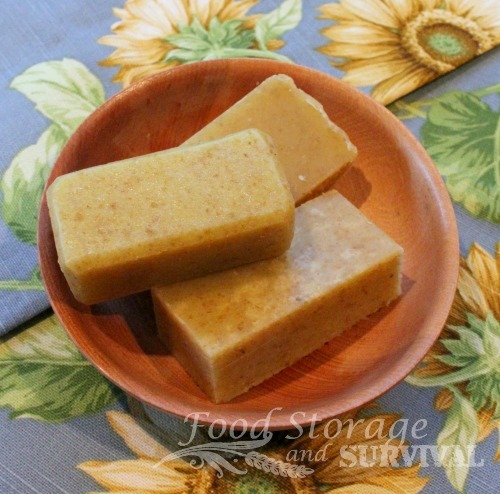 Extra lye is the reason “lye soap” is believed by many to be harsh. Also, #5 plastic is far far safer than glass for mixing lye, and steel is fine with lye (NOT aluminum though, lye eats aluminum). I’ve never made soap so those of you that have might think this a silly question. You said not to use metal for the lye but then your photos show you pouring the lye mixture into the metal pot with your oils. Now I’m confused. Is it OK at that point to pour it into your metal pot? I’ve clarified in the post. Stainless steel is okay, but anything with aluminum is not. I’ve poured it in a parchment lined cheapo metal cake pan and had it corrode the pan through the parchment while it was curing the first 24 hours.